Finding out you are pregnant is one of those lump-in-your-throat moments. Whether you’ve spent years trying, or are facing an unplanned pregnancy, you may find yourself feeling mixed emotions. That’s normal, most women find themselves on a roller coaster ride of emotions during those first few weeks of pregnancy, or longer. Happy – if this pregnancy was long awaited, you are likely to feel incredibly happy that you are pregnant. Even if this pregnancy was a complete shock, you are still likely to feel happy about the prospect of being pregnant. During moments of happiness, focus on yourself and your developing baby, and try to remember all the reasons you have to feel happy about the pregnancy. Upset – it’s normal to grieve the loss of an old life. After all, you’ve just discovered that for the next nine months, alcohol, your favourite cheese and pate are off the menu. You may be worried about growing out of your clothes, and morphing into a pregnant woman. Scared – pretty much all pregnant women feel scared at some point. You may be scared about the pregnancy, worried about the birth, or terrified that you won’t be a good mother. A little bit of fear is a normal part of pregnancy, especially during the first few weeks as you adjust to the news. If it is keeping you awake at night, affecting your appetite or leaving you unable to concentrate, speak to your healthcare provider for advice. Guilty – chances are, if you’re feeling upset and scared, you may also be feeling guilty. Motherhood guilt will last you a lifetime, and sadly it starts as early as that little blue line on your pregnancy test. Try not to feel guilty for having mixed emotions about the pregnancy. Remember that it’s ok to not be 100% happy all of the time. Not only are you at the start of a life-changing journey, but you’re also experiencing the emotional roller coaster associated with the hormone increases of early pregnancy. Unprepared – this emotion is particularly strong for women facing unplanned pregnancies. You may be worried this is the wrong time, or that you’re not ready to be a mother. But, as your planned pregnancy counterparts will tell you, they are thinking all the same things. Having a baby is a huge step, and self-doubt is a normal part of this. Whenever you feel worried and unprepared, do something proactive to help you get ready for motherhood. 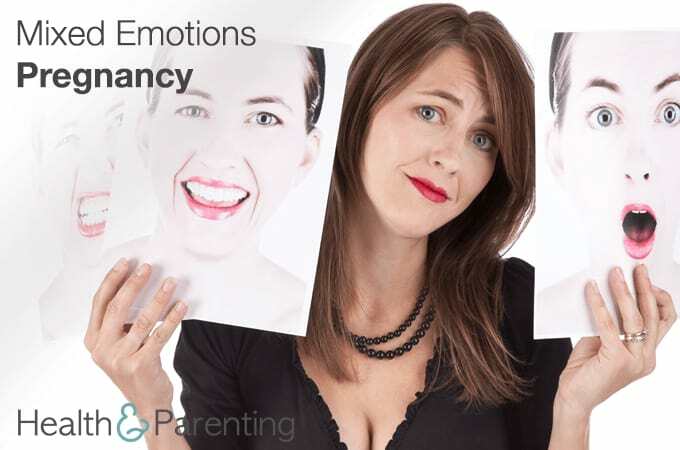 Angry – if the pregnancy came as a surprise, you may be feeling angry that this has happened. Perhaps you are angry with yourself, or angry with the father, or simply angry at the situation. There’s nothing wrong with feeling angry when life throws you a curveball, but it’s not a particularly helpful emotion. Try to channel your energy into something more productive, like planning the nursery or working out how you will cope as a new mum. Isolated – during the first trimester, as you battle with mixed emotions, you may also be keeping your pregnancy secret. This can lead to feelings of isolation. If you don’t want to tell all of your friends and family just yet, why not tell just one person so that you can talk about your feelings. Some people cherish the secret during those first three months, but if you are finding yourself struggling without the advice and support of your best friend, it might be time to break the news. It may not be something that many women talk about publicly, but feeling mixed emotions about pregnancy is pretty common. The best thing to do is talk about it. Find someone you trust, and tell them exactly how you feel. This could be your partner, best friend, a counsellor, your healthcare professional or a total strange on an online forum. Talking about how you feel should help you to start making sense of your mixed emotions about pregnancy. How did you feel when you discovered you were pregnant?